The wave of next-generation Internet speeds is coming, as Google Fiber and AT&T's U-Verse with GigaPower networks lead the charge. These fiber-optic networks offer blazing data speeds of up to 1 gigabit per second; what's more users on these networks can download huge files like HD movies in a matter of seconds as opposed to the minutes it takes on traditional networks. AT&T has already announced plans to bring its 1Gbps fiber-optic service into four metropolitan areas--Austin and Dallas in Texas and Raleigh-Durham and Winston-Salem in North Carolina. On Monday, the telecom giant said it's looking into expanding its network to 21 other major markets. That would bring fiber services to 100 cities, AT&T says. "We're delivering advanced services that offer consumers and small businesses the ability to do more, faster, help communities create a new wave of innovation, and encourage economic development," Lori Lee, senior executive vice president for AT&T Home Solutions, said in a statement. "We're interested in working with communities that appreciate the value of the most advanced technologies and are willing to encourage investment by offering solid investment cases and policies." By contrast, Google Fiber, which went live with the first gigabit network in Kansas City two years ago, has announced plans to expand to 34 cities in nine metro areas. 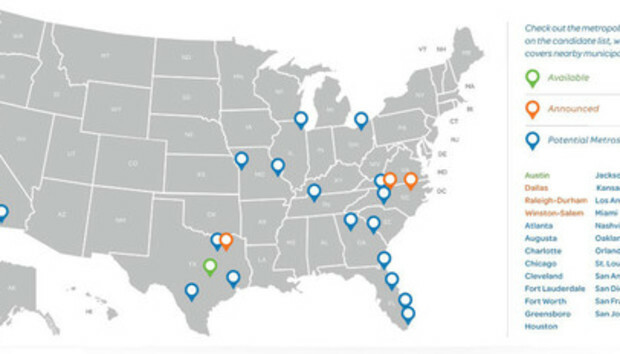 In addition to KC, Google Fiber is live in Austin, Texas and Provo, Utah. Thus far, both AT&T and Google have focused their efforts on smaller metropolitan areas in the US. Monday's announcement by AT&T paints a more broad vision for the Internet's future. Of course, getting there could prove challenging, as fiber networks require massive spending to physically lay the cables that customers need to access the Web; they also require some form of regulatory approval to begin work. Getting that approval is no slam-dunk, and the companies have to work hard to analyze topography, housing density, and map out electrical, water and gas lines to ensure their rollout plan is feasible. It's a big, expensive project, and will take a good amount of time to come to fruition. But that's not going to stop the likes of Google and AT&T as they work to extend the next generation of Internet speeds to more customers. Now, if only we could get rid of those damn data caps. Grant Gross of IDG News Service contributed to this report.